Even if it's more than a year until our daughter will start attending nursery school, we're already looking at which one to wish for. You see, in our part of town there's a lot of kids and not too many nursery schools, so your first choice isn't always the one you get. But today my wife walked by one that I feel must be a winner. Looking at this particular nursery school, my wife thought she spotted a photo of someone familiar in one of the windows. So what she did was take a picture of that particular window that she showed me triumphantly when I arrived home from work. Although very granular, I recognized the motive instantly. ”That's Elvis,” I blurted out. ”From the movie Stay Away, Joe”. My wife smiled at me. ”This must be a great nursery school, don't you think,” she kidded. I went to the computer to download the photo from the camera and manipulated it as best as I could in Photoshop. A search on the Internet for images from Stay Away, Joe then made it possible to identify the photo as the one used on the cover of the ”U.S. Male”/”Stay Away” single. Surely it must be a sign. 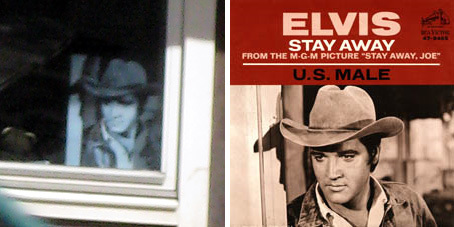 A nursery school with Elvis in the window has to be our first choice. And of course it helps that it's the one located closest to our home as well. Keep up the GREAT work Thomas...LOVE reading your great articles!! Thanks for the praise, Mike, it means a lot! Elvis ... If He's Out There We'll Find Him!